Inactivating mutations of the SOST gene cause a reduction in sclerostin levels and are associated with high bone mass. The clinical phenotypes, sclerosteosis and van Buchem’s disease, were described in 1950s. Much later, it was learned that both diseases are due to loss-of-function mutations in the SOST gene. As a regulator of an important osteoanabolic pathway, Wnt, inactivation of SOST leads to a stimulation of the pathway it regulates. The high bone mass in patients with either sclerosteosis or van Buchem’s disease is associated with unusual skeletal strength; they do not fracture. Knowledge of this molecule and its actions led rather quickly to the development of anti-sclerostin antibodies that lead to marked increases in bone mass in both animals and human subjects. Blocking sclerostin action with anti-sclerostin antibodies is a promising new therapeutic approach to osteoanabolic therapy of osteoporosis. Conflicts of interest: A.G. Costa: none; J.P. Bilezikian: is on the Advisory Board for Amgen. Costa AG, Cremers S, Rubin MR et al. Circulating Sclerostin in Disorders of Parathyroid Gland Function. J Clin Endocrinol Metab 2011. doi: 10.1210/jc.2011-0566. van Lierop AH, Hamdy NA, Hamersma H et al. 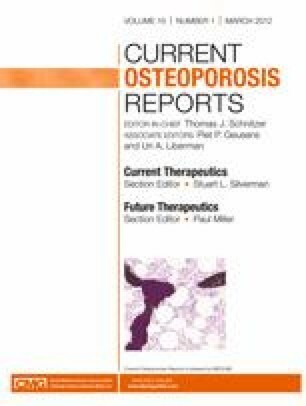 Patients with sclerosteosis and disease carriers: human models of the effect of sclerostin on bone turnover. J Bone Miner Res 2011. doi: 10.1002/jbmr.474. Li C, Ominsky MS, Tan HL et al. Increased callus mass and enhanced strength during fracture healing in mice lacking the sclerostin gene. Bone 2011, doi: 10.1016/j.bone.2011.08.012. Ominsky MS, Li C, Li X et al. Inhibition of sclerostin by monoclonal antibody enhances bone healing and improves bone density and strength of non-fractured bones. J Bone Miner Res 2010; doi: 10.1002/jbmr.307.